« Maple Walnut Chocolate Dipped Bacon – Keto Approved! 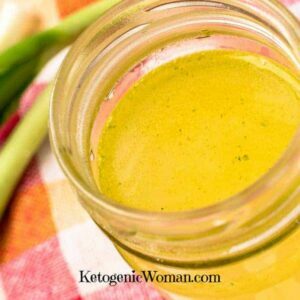 One key skill to learn when doing Keto is how to make your own homemade chicken broth. 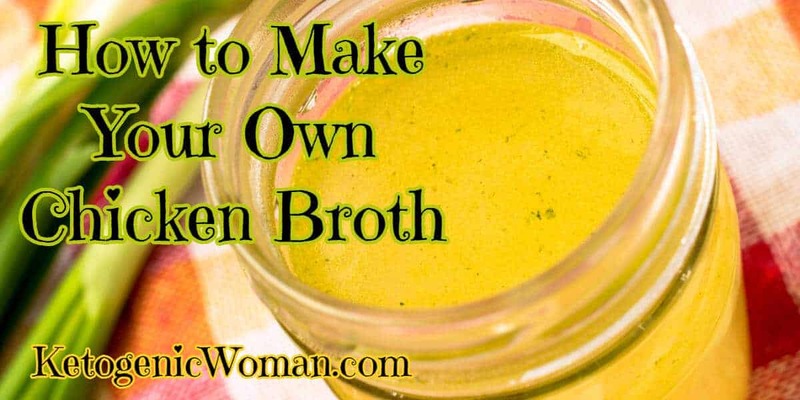 It is really just so easy and homemade chicken broth has so many health benefits as well. And if you have checked out prices for store bought organic chicken broth in a carton, it can be just as expensive as the darn chicken! So why not take a few extra minutes to save those leftover chicken pieces and vegetable scraps. The best way I have found is to keep a large ziploc freezer bag in the freezer and throw them in there. Then when it’s full, it’s time to make a batch of homemade chicken broth! You can save the scraps and carcass from either your own homemade chickens as well as those super handy rotisserie chickens you pick up from the supermarket. Once you have followed the directions below and have the broth, the best way to store is freeze it in usable portions. I like to think ahead to include recipes that not only use large amounts of broth (such as soups) but those recipes that might only need small amounts, such as a sauce. Ice cube tray – Freeze a couple trays and then when frozen pop them out into a large ziploc bag. Perfect for when you need small amounts of broth. Silicone muffin pans – these will freeze portions that are about 1/2 cup each. Once frozen you can dump them into a bag for storage. Large ziploc bags. Fill them with a quart of broth and lay them flat in the freezer for better storage. Perfect for when you are making a batch of soup. Glass Jars are perfect for storing your homemade chicken broth in the fridge. Having homemade chicken broth in your freezer is one of life’s simple joys. It’s super easy to make and it is a great way to use up all those fresh herbs and vegetables you didn’t get around to using. Simply freeze whatever portion you don’t use right away, and then pull it out whenever you want to make a quick soup, stew, or slow cooker meal. Add olive oil to a large stockpot or Dutch oven and heat over medium-high heat. Add onions, garlic, and celery to heated olive oil and sauté for 5 or 6 minutes, or until the flavor is released. Place the roasted chicken carcass in the pot and fill with enough water to cover. Add thyme, rosemary, bay leaves, parsley and whole peppercorns. Season with salt, to taste. Heat over medium-high heat until it just about boils, and then reduce heat to medium-low. Stir and simmer, uncovered, for at least an hour. (The exact amount of time can vary – the longer it simmers, the better the flavor will be). Place a stainless steel strainer over a large heat-proof bowl or container in the sink. Carefully pour contents of stockpot into the colander to separate out the solids from the liquid. When cool enough to handle, remove edible chicken meat from the strainer and set aside to make chicken soup or for another recipe. Discard chicken bones, skin, and fat, along with the vegetables and herbs. Taste reserved broth and season with salt and black pepper, to taste. Use immediately or allow broth to cool completely before transferring to freezer safe-storage containers. Freeze until ready to use. Tip: As you cook throughout the week, freeze leftover edible vegetable and herb stems and scraps in a freezer-safe bag. Use these scraps whenever you make a new batch of stock. Tagged keto chicken recipe. Bookmark the permalink.